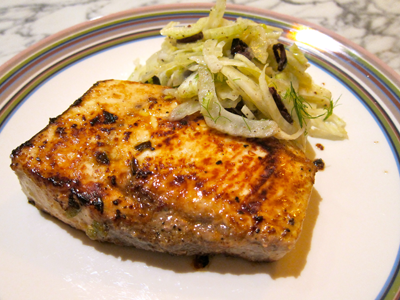 Seared Jalapeño/Garlic Swordfish Steak w/Fennel/Olive Salad | eat. live. paleo. Last night for dinner, I seared local swordfish filets and made a simple, fennel/olive salad as an accompaniment. Easy, breezy, tasty! 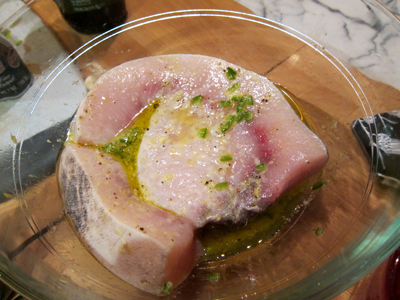 I let the swordfish marinate for about 20 minutes. 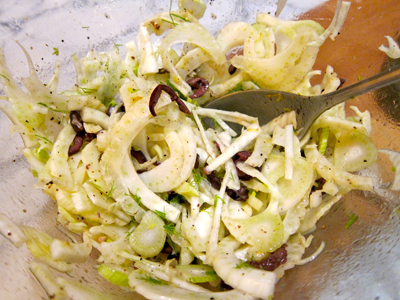 Meanwhile — I made a simple fennel/olive salad, which David loves. The salad goes well with meaty fish as well as, I think, pork. The aroma of the fennel pairs nicely with swordfish, and the fresh crunch gives the dish a lovely texture. For the salad: thinly slice 2 fennel bulbs (cut the bulb half, then thinly slice the halves). Put the fennel in a bowl, and add: zest and juice of one lemon, a handful of pitted kalamata olives, pitted and finely chopped, a drizzle of olive, and salt and pepper to taste. Toss well. Sear the swordfish steaks about 7 minutes on each side (depending on the thickness) — ours was about 1 1/4 inches. Serve the fish with the salad. Enjoy!